Aussie World is a small traditional park located a little less than an hour north of Brisbane. Billboards within the place proudly proclaim that it's on your way, possibly a slight exaggeration in my case, but certainly true for all those driving along Bruce Highway. One of the first things anyone will notice about the park is how friendly the staff are. Australians do tend to be convivial at the best of times, but speaking from personal experience it can be quite challenging from those in a customer service position to maintain a happy face day in, day out. The park was almost empty today, and as a result lots of the ride operators were striking up short conversations with their guests. One of them spotted my coaster enthusiast shirt from a distance, coming over to tell me all about his personal responsibility, the Wild Mouse (#1478). 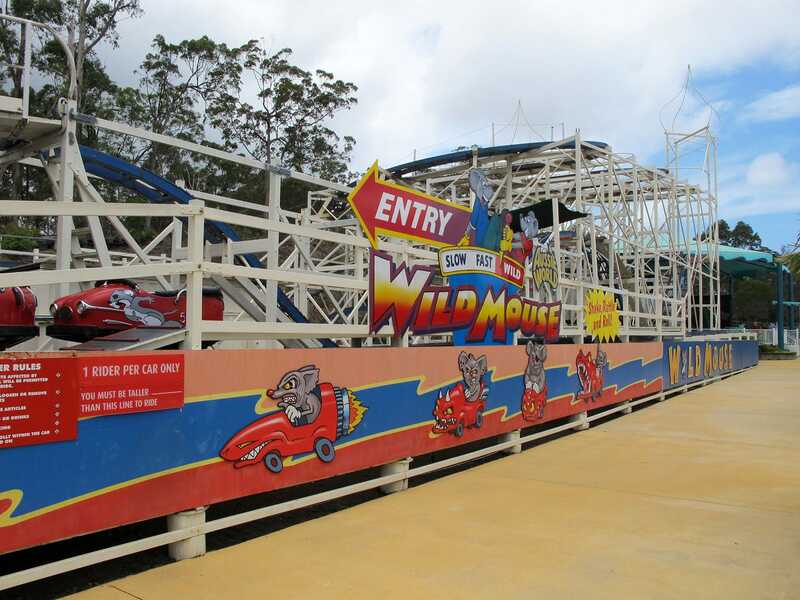 Built originally in the mid-fifties, this particular Wild Mouse was relocated to Aussie World ten years ago from the Royal Showgrounds in Perth. Though it requires considerable maintenance to keep going it has nevertheless managed to run pretty much continuously ever since, other than occasional windows where portions of track are rebuilt. The layout features very powerful lateral forces and intense airtime, particularly in the latter half of the course. Other rides in the park include a collection of classic spin rides, such as a Carousel, a Pirate Ship, and a Polyp. My eye was drawn to the Rock'n'roll Rebel Dark Ride, though this turned out to be a customised Music Express ride, with some brightly coloured neon lighting. Most of the remaining attractions are targeted at a very young audience, and perhaps unsurprisingly these were the busiest in the park.